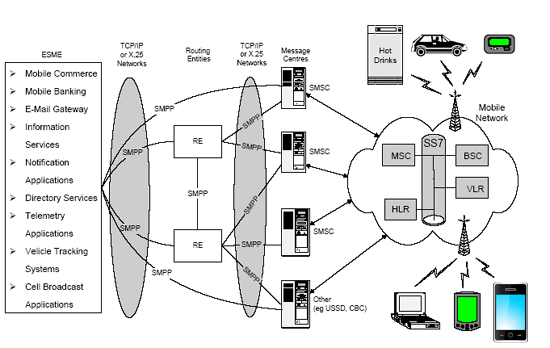 The Short Message Peer to Peer (SMPP) protocol is an open, industry standard protocol designed to provide a flexible data communication interface for the transfer of short message data between External Short Message Entities (ESME), Routing Entities (RE) and Message Centers. SMPP is capable of carrying any message type, just like UCP/EMI. For a better understanding of SMPP, you should be familiar with some of the following terms. A Message Center (MC) is a generic term used to describe systems such as a Short Message Service Centre (SMSC), GSM Unstructured Supplementary Services Data (USSD) Server, or Cell Broadcast Centre (CBC). An ESME typically represents a fixed network SMS client, such as a WAP Proxy Server, E-mail Gateway, or Voice Mail Server. It may also represent a Cell Broadcast Entity (CBE). A Routing Entity (RE) is a generic term for a network element that is utilized for MC to MC and ESME to MC message routing. A RE has the ability to emulate the functionality associated with both an MC and an ESME. To an ESME, a RE appears as a MC and to a MC, a RE appears as an ESME. A carrier may utilize REs to hide a network of Message Centers, presenting only the REs as the external interface points for ESMEs.